Poker night is the epitome of a guys night in. Getting your closest friends and sitting around a green felt table to play cards can be a lot of fun if done right. Preparing everything may take some planning if you’ve never hosted a poker night before, so GREY is here to give you a few helpful pointers. Obviously, to play poker you need the equipment to do so. You’ll need cards and chips to bet with. You can buy simple plastic poker chips at almost any game or toy store. If you want something that looks more like it’s out of a casino you can find more expensive options online. You can even buy a set that comes with a few extra accessories (like a chip organizer or rule book) as well. A big part of any poker night is the food and drinks. It’s important to have a variety of options in case one person isn’t into something. Having each guest bring a food item or beverage can be a good way to make sure everybody has at least one thing they like. Having people bring a craft beer or snack of their choice also ensures there’s plenty to go around and lowers the financial burden of the host. It helps if you have snacks on a designated table away from where you’re playing. People cans spill drinks or crumbs and the last thing you want to do is mop up someone’s beer while trying to figure out what to bet. If you really want to get classy you can try making a few cocktails, in which case I’d refer you to the Hidden Cocktails series of articles in the GREY Journal for some inspiration. Planning everything out only to have a lot of people cancel on you can be rough. Make sure that once your chosen group has agreed on a date you remind them about it at least a week in advance. Get them to put it in their calendars if you can, that way the event will be a little more committed to memory on their part. It’s also a good idea to text a reminder to them the day before. It doesn’t have to be pushy or obviously nagging, just a simple and straightforward message to let them know you’re still on. If by chance you do get canceled on last minute by the majority of your group, make sure to have a backup plan. This can be a different game that requires fewer players, a movie, or something else. There are plenty of other games you can play with a deck of cards (Hearts, B.S, Spoons, and Rummy) so you don’t necessarily have to buy board game if you don’t want to. Video games can be a good option if you have enough controllers for everyone, but if not someone will inevitably end up sitting out. Whatever you end up with as a backup plan, just make sure it’s already thought out before your guests arrive. I’m not saying you’ve got to clean your whole place top to bottom with bleach, but it doesn’t hurt to do a walkthrough in someone else’s shoes. Look around and think about what your friends would see on the way to the room you’re playing in. Sweep or vacuum if it’s needed, spray some air freshener, clean up anything laying on the floor that doesn’t need to be there. If the weather allows it, open the windows and get some fresh air in. A lot of people are nose blind to their own houses so after a while they don’t realize other people might be put off by entering their home. Even if you don’t think you place smells, it still might anyway so take precautions and air the place out a little. Make sure you know the rules. You don’t want to spend the first 20 minutes of the night on your smartphone trying to figure out how to play. Read the rules beforehand, play a practice game with yourself or a friend to get the hang of things. If a lot of the people coming aren’t likely to have a grasp of the game, it could be helpful to invite a friend who has more experience. Do you want real money on the line? If so, what is each chip worth? In my experience, a typical set up has the following values: white is $5, blue is $10, red is $20, and green is $30. Of course, this only if you want to bet with real money. Not everybody can play with actual stakes, it depends on your income. Besides, playing with money can foster grudges within your friend group, so having different stakes may be preferable. Some people bet with food (chips, popcorn, etc), others bet favors (yard work, house sitting, etc.). Even if you don’t end up betting with anything real you can still have a great time. At the end of the day, the game isn’t the reason you’re hosting, it’s your friends that are important. It helps to lay some ground rules before the game starts. What they are is really up to you and how you want the night to go. You’ll have to figure out what the maximum number of chips people can start with is, whether or not players can wear sunglasses at the table, if you’ll allow cell phone use, etc. All of these rules are to make sure people start on an even playing field and prevent cheating so figure out what works best for you and your friends. Some background music can go a long way in setting the mood for a fun night in. While your playlist should probably lean toward the tastes of your company, songs that are exceptionally loud or lyric heavy can be distracting for players (especially beginners). I always lean toward jazz or blues music because they keep a generally calm and cool feeling throughout the night. It helps to have a set end time so people know when to leave. Eventually, you’re going to want to go to bed and an all-night game sounds fun in theory but is taxing in real life. Your guests may have obligations or families to go back to, so giving them an end time makes it easier to plan it in their schedule. 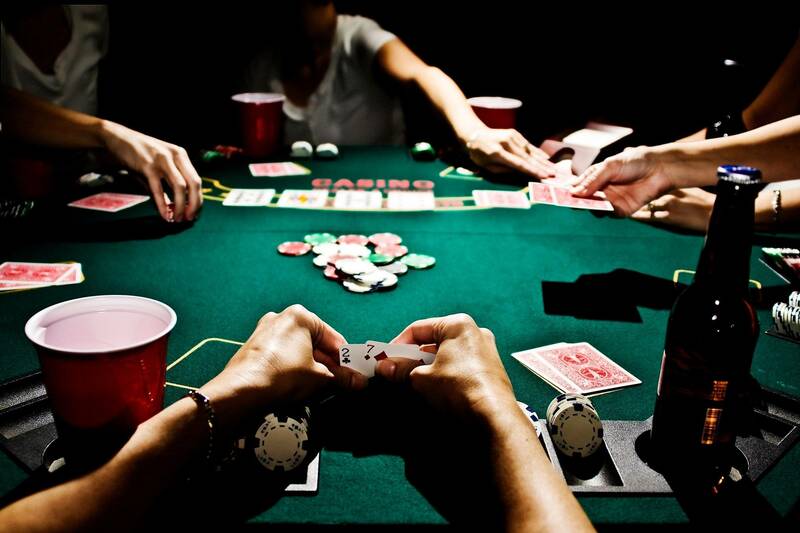 What do you think of our poker night tips? Do you have any tips of your own? Let us know on social media or in the comments!